Good eyesight is obviously important for Air Force pilots and other personnel. But even if you need prescription eyeglasses to see, you can still be accepted into the Air Force. Don't plan to wear contact lenses, though. The Air Force doesn't allow them during basic training and discourages their use in the field. Here's what to know about eyeglasses and the Air Force. When recruits arrive at Air Force Basic Military Training, they undergo a complete eye examination. 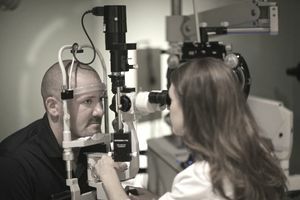 This is different and more involved than the eye examination they undergo at the Military Entrance Processing Station (MEPS,), which is to determine if a recruit meets the basic vision requirements to join the military. The eye examination at Air Force basic training is to determine whether a new recruit needs glasses, and- if they do, to order government-issue glasses and eyeglass inserts for a gas mask. You cannot wear contact lenses during basic training. You also cannot wear your civilian glasses, once you have received your official government-issue glasses. In the past, government-issue glasses had thick, hard plastic frames, with thick, hard plastic lenses which were very difficult to break. However, the Air Force realized that a majority of recruits were throwing these glasses away, or throwing them into a drawer after basic training because they were uncomfortable and unappealing-looking. The Air Force now offers recruits a variety of eyeglass frame choices. Once you receive your government issue glasses (a few days after your eye examination), they are the only glasses you are allowed to wear while at basic training. If you don't really need glasses to see, you won't be required to wear them. Why Can't I Wear Contact Lenses in the Air Force? As you may have gathered, wearing contacts is discouraged in the military. There are a variety of reasons, but one serious concern is exposure to tear gas. Contact lenses can be badly damaged and deteriorate if exposed to some gases, which could lead to long-term eye damage over time. In addition, contact lenses require a hygienic environment for their care, and conditions in the field may not lend themselves to adequate care. This can lead to abrasions and infections, as it would in a civilian who did not regularly clean or change his contact lenses. After graduating from basic training, Air Force recruits (now airmen) are allowed to wear their civilian glasses again, as long as they conform to military dress and appearance regulations. Generally, that means the color must be conservative, no designs or decorations on the frames and no tinted lenses when indoors, or outdoors when in military formation. Be advised that even after basic training, while in uniform, airmen may not wear their glasses around their necks (on lanyards) or on top of their heads, per Air Force uniform requirements. Of course, this only applies when wearing a military uniform. When an airman is in civilian clothes, he can wear whatever glasses he chooses once he's out of basic training.